Let’s say, you hear the doorbell ring. Obviously you have a visitor. What do you normally do when the doorbell rings? You get the door, don’t you? 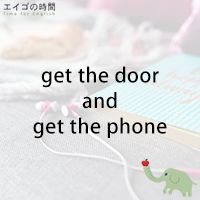 To get the door means to answer the door. For example, the doorbell rings but you’re in the kitchen fixing some sandwiches for lunch. So you ask your husband, “Hey hun, will you get the door please once in your life?” If you ask your little daughter to get the door, you need to make sure that your daughter will see who’s there first before opening the door. Now, what do you do when the phone rings? You get the phone. That means you answer the phone. You can learn these expressions in pairs. When the doorbell rings, you get the door. When the phone rings, you get the phone. Now, why don’t you try a quiz? I’ll read three sentences. Please listen carefully and choose the one that is TRUE. Ready? 1. To get the phone means to make a phone call. 2. To get the phone means to answer the phone. 3. To get the phone means to get off the phone. Next Post ママ、誰か来たよ。 – Mom, someone is at the door.